Walking on a lead is not a natural activity for your dog; there’s no equivalent in the wild! Your dog’s natural pace is much faster than your walking pace; in your dog’s eyes, you walk S-L-O-W-L-Y! So, putting your dog on a lead means asking him to adjust his pace massively. How easy do you find walking (or running) at someone else’s pace when it’s much slower than you’re used to? Dogs don’t naturally walk in straight lines! Watch your dog off lead and you’ll notice he zips from side to side, taking in sights and smells. So, putting your dog on lead means teaching him a whole new way of being. Define what you want. This is critical to teaching ANY dog behaviour. You need to decide what loose-lead walking means to you. Does it mean having your dog’s attention on you the entire time? Or is your dog allowed to stop and sniff around his environment? Does your dog need to be at your side or is it ok for him to be slightly ahead or behind you? How much tension will you tolerate on the leash? It’s completely up to you – but you must choose; and you must be consistent – so that you give your dog a clear message. Otherwise Fido will be fonfused. Practise inside/in the garden first. This makes it easier for your dog to concentrate as there are fewer distractions. Walk around indoors and practise getting your dog to follow you – perhaps by making a kissy noise. Reward your dog when he or she is side by side with you so you reinforce that position. Also, try and get eye contact from your dog before rewarding him. Equipment. If your dog is a strong puller, I recommend using a front-hook harness. Perfect Fit and Xtra Dog do great, padded harnesses that are comfortable for your dog and have front hooks. NB: Choke chains, prong collars and shock collars do not work. Tools like these may give the illusion of a quick fix but what your dog learns is that walking next to you is painful and unpleasant. Bags of reinforcem ent! Fill a treat pouch with (small) pieces of treats. When you practise inside you may be able to get away with using kibble but when you take it outside, remember, your treats need to be more interesting than the sights and smells outside! Try practsing loose-lead walking before your dog’s meal times so he’s extra eager for treats! Find out your dog’s favourite treat and reserve it for loose lead walking so your dog thinks “whoopee” when you get his lead out! Reward often. At first, do this every couple of steps; get your dog to look at you before you treat. Increase the number of steps between rewards GRADUALLY – don’t expect too much too soon! Remember loose lead walking is completely counter intuitive for your dog and new habits take time to embed.  (Imagine you are learning a new dance with intricate steps – you’ll need a teacher who gives clear, consistent messages- your dog needs the same!) The most common issue with dogs that pull is that the dog isn’t rewarded often enough for getting it right. Relax your grip. 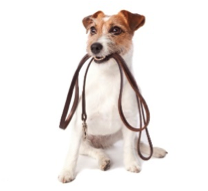 Give your dog length on the lead so that he or she is learning to choose to walk with you on a slack lead. This gives YOU the opportunity to reward your dog for making good choices. Rather than forcing your dog to walk next to you by having the lead so short he cant do anything else. Mix it up! Sometimes give your dog just one treat for walking nicely, sometimes give several. Every now and then, feed a handful if your dog is doing well. This keeps your dog’s interest high and makes lead walking exciting! Be unpredictable. Slow down, then speed up, change direction – often! And reward your dog each time he chooses to stay with you. Do this sensitively though, give your dog time to get it right! Anticipate distractions. Scan ahead for potential distractions and ensure you have your dog’s focus as you walk past the distraction. Reward your dog for keeping his attention with you – remember this is hard for your dog so help him succeed. Practise other behaviours. Stop at random and ask your dog for a sit or down or high five – you could even hide a piece of food for your dog to sniff out! Doing this keeps it interesting for your dog as well as giving him chance to hone other behaviours. If your dog pulls. Stop dead. Be really clear with your dog that pulling = you go NOwhere. Wait for your dog to ‘reconnect’ with you ie to look at you, then guide your dog back into position and set off in a different direction. Short and sweet. At first keep your lead walking sessions short. 5-10 minutes of good quality lead walking is far better than 30 minutes of mistakes and pulling. Little and often is good – and it reduces stress levels for you! 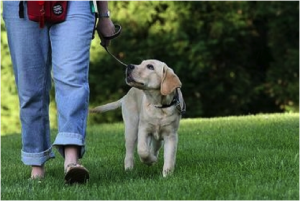 Lead walking requires lots of concentration from you – and your dog – especially in distracting environments! Your dog will show you what is valuable and important to him. If your dog is pulling consistently, it simply means that walking next to you isn’t as valuable to him as whatever he is pulling toward. But you can change that! Be patient. Enjoy learning with your dog. For advice on this or other dog or puppy training challenges, contact Joyful Dogs: joy@joyfuldogs.co.uk | 07717 89 44 14.